Rule: Buy a stock if it has shown upward movement by X-percent from recent bottom and sell out of it has fallen by X-percent from recent top. The above rule is assuring a ride on an upward moving stock and exit on a downward trend. However, finding the value of X is little difficult. For most of the stock it can be approximated around 20%, but, index (like NIFTY) and large companies stocks will show less than 20%. The smaller companies will show more than 20%. It also varies across time and market conditions. Here is an example to show the impact of this rule which can be validated in very simple way. 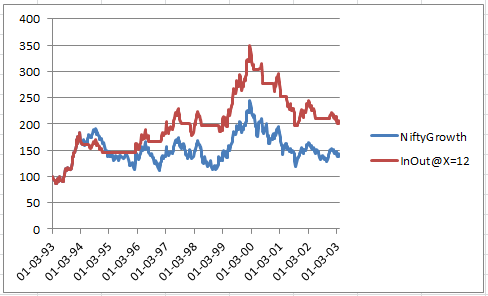 In the first chart the impact of this rule is shown on 20 years NIFTY data. In this chart from 1993 to 2007 we have taken value of X=12% and 2007 onwards we have changed the value of X=15%. This change was evident from past two years data (notice high fluctuation in movement started during this period). Due to application of our rule and one time change in the parameter value, we have got 16 times return in 20 years while NIFTY has 8 times appreciation in value. Above chart gives illusion to many folks that Rule-X has major impact only in the last 5 years. However, this is just an illusion due to the relative size. 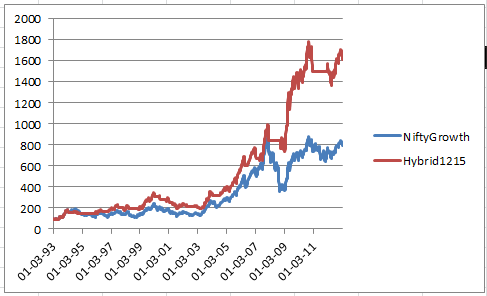 Below is chart for first 10 years which shows similar impact(50% return vs. 100% return). Disclaimer: Value of X=12 and 15 is just indicative and we are not claiming these values were most optimal for NIFTY during those periods. The purpose of the above example is to show the power of Rule-X. We have selected NIFTY as sample because movement of NIFTY is representation of top 50 stocks of the country. It shows that this rule is not stock specific or time specific. Our APS product periodically computes the optimal value of X and does the analysis on basis of the same. This rule is open, however, optimal computation of value of X is highly complex in nature and actual implementation is intellectual property of the company.